Mary Jane’s parents, two young sons, only brother, sister, husband, Philippine private lawyer from NUPL, two Indonesian lawyers, spiritual adviser, Philippine consul general and two OUMWA officials visited her, thinking at first it will be a gloomy visit because they did not bring any good tidings. It was confirmed by her Indonesian lawyers that the death sentence by firing squad may be implemented on April 28 starting at 5pm AT THE EARLIEST, unless a court order or clemency puts a halt or pause to it. Except for an initial emotional encounter with her only brother, Mary Jane was her usual bubbly and loquacious self, exuding a well of inner peace and confidence. She obviously was well-liked and admired by prison officials, guards and fellow inmates. The reunion lasted from 1030am-430 pm with everybody either sitting, squatting or lying down on a synthetic grass carpet laid down by prison officials for the visit, a picturesque image of a simple family having a simple life spending a simple Sunday lazy afternoon. After a mass, there was a lot of banter, bonding, joking and just small talk. They all ate together a simple yet spicy meal using their hands. It looked and felt surreal. She misses her two other sisters in the Philippines and Bahrain and requested that she connect with them via audiovideo call. She reaffirmed before everybody that she is absolutely innocent. She confirmed also that it was the police that provided her, not our embassy, legal counsel during the trial stage. She agreed that her fight is not yet over and exhorted her family not to give up. Mary Jane is amazed how her godsister Cristina Sergio could still deny her culpability and even went to the extent of making up stories to cover her evil scheme in cahoots with her live-in partner Julius Lacanilao. She vows and requests the NUPL to pursue the cases against them and others not only to give her justice but to save other future victims. Mary Jane clarified also that the four letters she handed out yesterday were actually written in January 2015 when she started to really feel — after 5 years — that the Philippine government was finally assisting her. 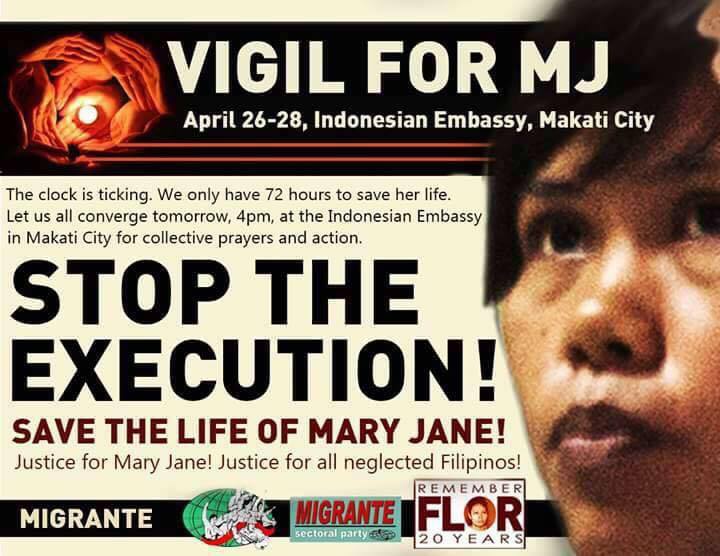 #StoptheExecution #SaveMaryJane If the French President can do it, why can’t Aquino?